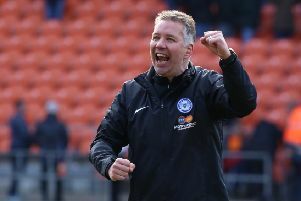 Peterborough United will be gunning for revenge when Oldham visit the ABAX Stadium for a League One fixture on Saturday (March 18). Grant McCann’s men delivered one of their worst performances of the season at Boundary Park in January when slipping to a 2-0 defeat against a team who were then in the bottom four. Craig Mackail-Smith (foreground) and Tom Nichols are beginning to click as a Posh strike parnership. McCann hasn’t forgotten that abject display and he will remind his players about it before they take on a team in pretty decent form. “We owe them one,” McCann stated. “There’s no doubt about that. “We were very poor up there and we 100 per cent deserved to lose. They’ve probably improved since then as they are stringing some good results together. “But this game will only be as hard as we make it and if we play like we did at Chesterfield on Tuesday we will win. “There were good signs in that game. We only drew so it was only a small step forward, but it was still an important one. “We were very positive in the meetings we had before the game and we carried that onto the pitch. “There were signs of a good partnership between Craig Mackail-Smith and Tom Nichols which augurs well for the rest of the season. “Craig was simply outstanding, while Tom set a goal up for him and scored one himself. I was pleased for those two as they’ve taken some stick. “We can take confidence into the Oldham game. It will be a completely different game to the other night, but it’s still one I believe we should win. Posh hope to have Marcus Maddison available on Saturday. He’s missed the last two matches because of an ankle injury. And Posh might need him to unlock a mean defence. Despite their season-long struggles, Oldham have conceded 37 goals in 38 League One matches, 16 fewer than Posh and five fewer than leaders Sheffield United. Only three teams have conceded fewer League One goals this season. Oldham have scored just 25 goals, the lowest in the division. “We’re hopeful Marcus will be training with us by the end of the week,” McCann added.